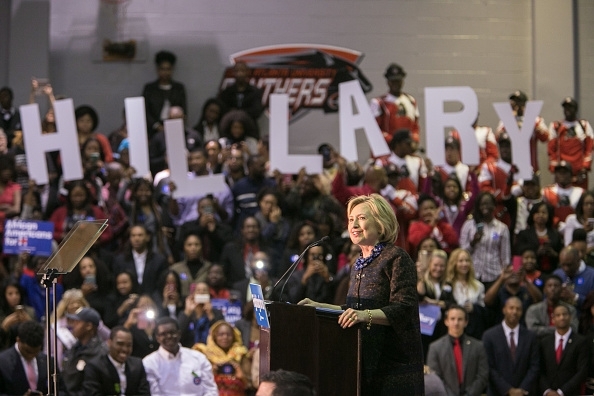 Hillary Clinton wouldn’t be the Democrat nominee without Blacks in the South. Bernie Sanders has been whupping her almost everywhere else because he promises free this and free that. Young Blacks are eating his candy by the spoonful but oldheads know the path to success doesn’t run through government offices and that wishing for governmental free stuff makes Americans soft. The nerds from the Ivy League that run the DNC think Clinton wins the White House without winning much between Virginia and Texas but I think she needs to win two of four certain states: Florida, Georgia, Virginia and North Carolina. She wins Georgia and/or Florida by keeping it close in the rural areas and going over the top in the cities. Rep. Sanford Bishop can deliver three of Georgia’s non-Atlanta cities and therefore counterbalance a quarter of rural Georgia. The Sanders factor should have Dems worried because his voters might stay home if progressive elements aren’t in the Democrat platform. Hillary Clinton can’t do it alone. A certain number of people will vote for Hillary Clinton while a large number of Black voters will be voting against Donald Trump. Hillary, gratefully take those votes. Another large number of Black voters will be folks voting to protect President Obama’s legacy from Trump and his minions. Again, Mrs. Senator/Secretary, Merry Christmas from the Obamas. So, this election will involve having billions on the table. The Democrat elite are planning on spending money raised in Atlanta on T.V. ads in swing states. A quarter of that money should be used as Get Out the Vote in the best Black state in the union….the peach. Nationally, we don’t need ads of Clinton in a hard hat, Clinton reading to school kids or Clinton watching a production line. We know the Clintons are good people. That money should be spent getting infrequent voters to the polls. Who is good at that? Me. I am calling it the way Babe Ruth called that home run or the way Curry tosses up a 3 point shot and walks toward the other basket. Hillary Clinton will be president and we will hand her Georgia on a platter. It’s not about her winning our state; it’s about us lighting a fire under infrequent voters. Next year, we want to see one Georgian in her cabinet…Ag Sec, Labor Sec, HUD Sec…a few names come to mind.